Saturday August 15th last year was something of a marathon day for me, with nine of the roughly 20 stories from the month. I’d left home that morning with a fairly ambitious schedule, five events spread out across the day from 10am until around 8pm, and came across a few more things to add as I travelled around. 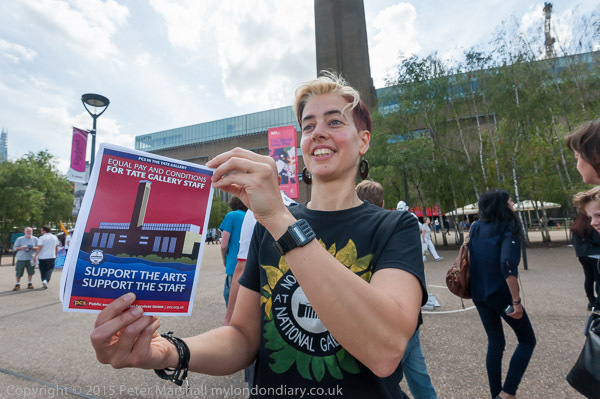 My day started outside the National Gallery where there was a rally by the PCS strikers at the end of the morning picket on the 61st day of their strike against privatisation and calling for the reinstatement of victimised union rep Candy Udwin. Joining in the protest there had been people from the Tate Gallery, where some privatisation has already taken place, with privatised gallery assistants getting paid £3 an hour less than their directly employed colleagues doing the same job, as well as minimal conditions of employment and zero hours contracts that fail to give them predictable hours or income. I went on to photograph their protest outside of Tate Modern, where Equalitate were handing out leaflets to the busy crowds walking past there, before leaving and taking the bus back to Aldwych and the Indian embassy. 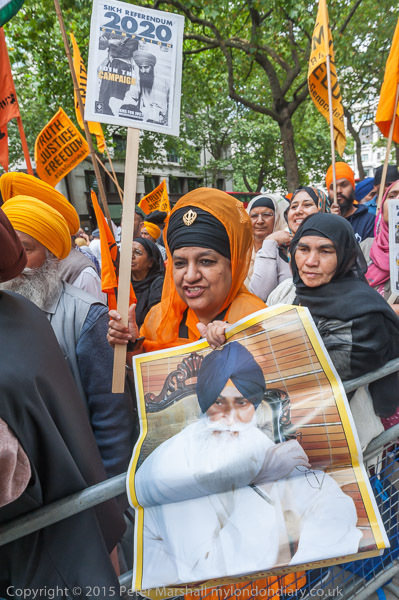 I’d come here for a protest by Sikhs on Indian Independence Day supporting the call by hunger striker Bapu Surat Singh for the release of Sikh political prisoners, but found that there was also a protest by Kashmiris. Kashmir is a disputed territory with areas occupied by India, Pakistan and China., and Independence Day is observed as ‘black day’ in Indian military occupied Kashmir. 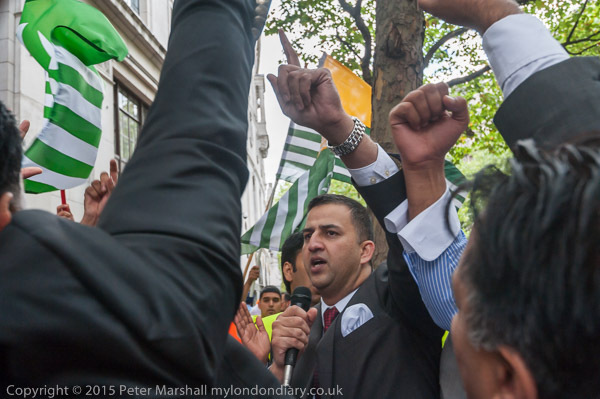 The Kashmiris want freedom for their country and the protest became quite heated at times. Back in Trafalgar Square there were also two events taking place. 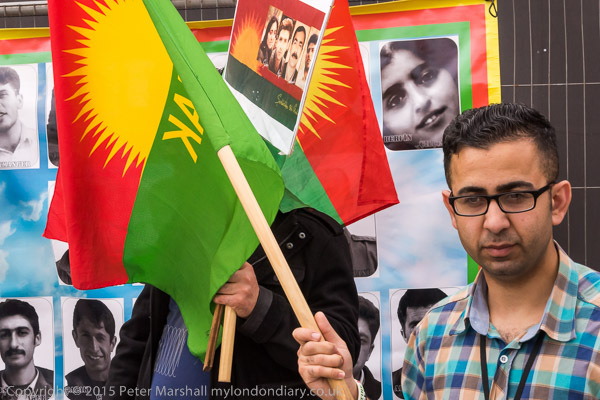 The Party of Free Life of Kurdistan (PJAK), an Iranian Kurdish group formed to fight against the Iranian regime for self-determination for Kurds in Iran and based close to the Iranian border in Iraq were celebrating their martyrs with flags, banners and posters showing their faces. 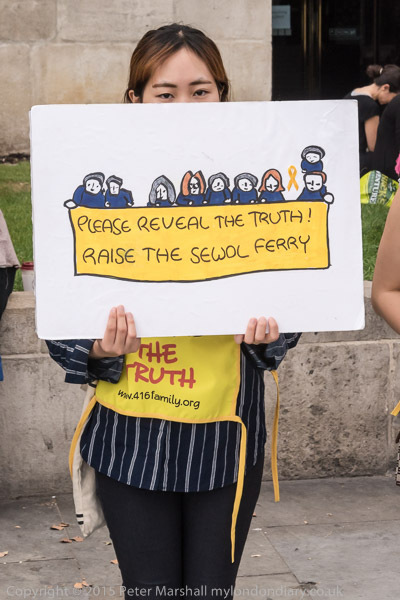 A short distance away was the regular monthly protest mainly by Koreans over the Sewol Ferry disaster, calling for changes in the Korean law and a full inquiry into the disaster which killed so many schoolchildren who were told to ‘stay put’ on the lower decks as the ship went down. 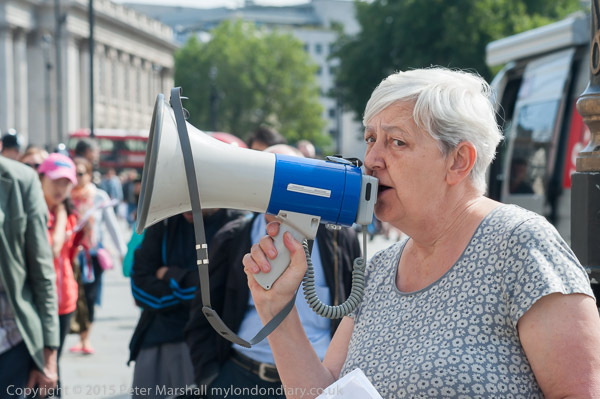 Next was another in the series of protests by United Voices of the World at Sothebys in New Bond St, where two workers remained sacked following an earlier protest calling for better conditions of service – sick pay, holidays and pensions – for the outsourced workers who clean Sothebys. 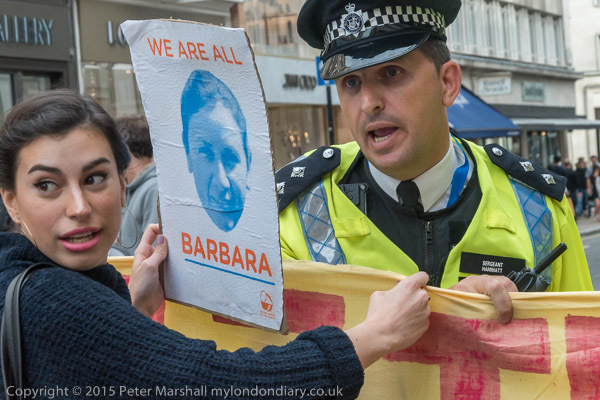 As usual there was a certain amount of friction between the protesters and police who tried to limit their protest. But on this occasion there were fewer police than previously, and they were less forceful in their intervention, largely trying to persuade rather than using force. By the time this protest ended I was tired and ready for home, but there was one last event I wanted to cover. 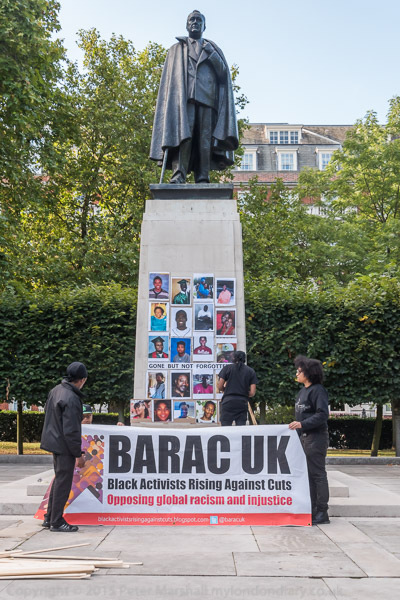 BlackoutLDN solidarity with Black US victims took place not as I had expected outside the US Embassy, but a short distance away inside the garden in Grosvenor Square, where there is a statue commemoration President Franklin D Roosevelt. It was an unusual event with contributions from a number of individuals and groups including BARAC and the Nation of Islam, and as well as speeches there were songs and poems. But I was getting tired and had to leave before the final lighting of the candles as it began to get dark. I had been on my feet too long, and my legs were suffering. I had to rest for a few days after this to get fit for the week’s holiday that was coming up. 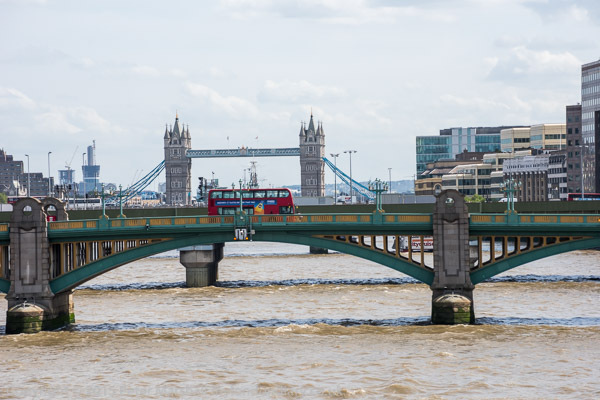 During the day I’d also taken a few pictures as I travelled around London, which are in London Views. Altogether I’d taken a ridiculous number of pictures – after deleting those which were obviously unusable I was still left with around 1,600 – around 25Gb of RAW files. Far too many! It’s good to be able to report that all three of the industrial disputes that I photographed on that day have since then been successfully resolved. This entry was posted on Sunday, January 10th, 2016 at 10:45 pm and is filed under Uncategorised. You can follow any responses to this entry through the RSS 2.0 feed. You can leave a response, or trackback from your own site.